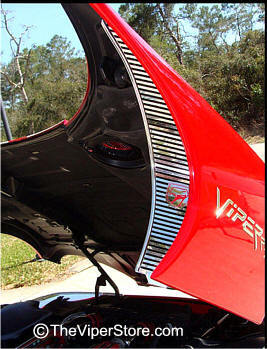 Highly Polished Viper Side Vents. What a difference this makes. Immediately noticeable. Highly professional look. 2 Pieces one for each side vent. Comes with everything you need for - Easy mounting. 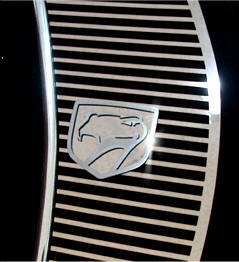 Comes with a 3-D stainless Viper Head emblem mounted in the center. 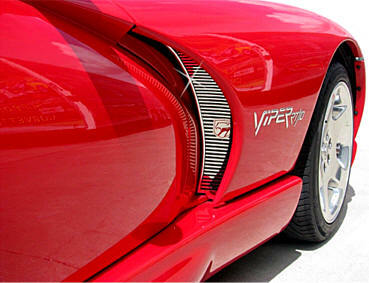 **92-98 Vipers - FITMENT NOTE: Designed to Fit Dodge Viper GTS or RT-10's 1999-2002. 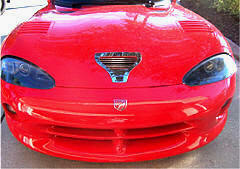 The grille will fit on 1992-1998 Vipers but will require you to customize the mounting. We provide extra brackets for this purpose. You may adjust and modify the mounting to suit. Red emblem shown no longer available. Comes in upgraded 3-D stainless now. Shown with 3-D stainless steel emblem - included. WOW! - It's a Jaw Dropper! 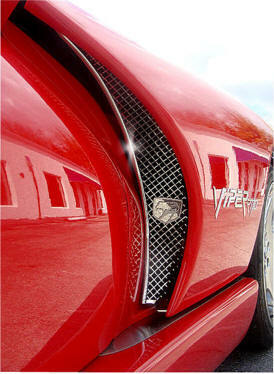 Highly Polished Deluxe Viper Side Vents. These are a Jaw Dropper!What an impression these make. What a difference this makes. Immediately noticeable. Highly professional look. 2 Pieces one for each side vent. Comes with everything you need for - Easy mounting. For all RT/10 Viper Gen 2 cars. This high quality solid aluminum with chrome trim finish grill will dress up the empty black hole at the opening of your hood air intake. Stays shiny. Heat and stain resistant. Self adhesive sides makes mounting easy. 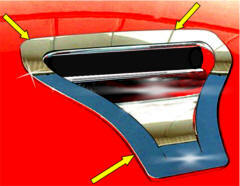 This part also fits with the Hood Scoop Plate part ACC-962010. 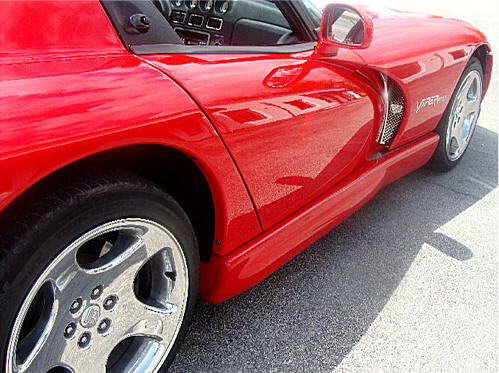 For all RT/10 Viper Gen 2 cars. 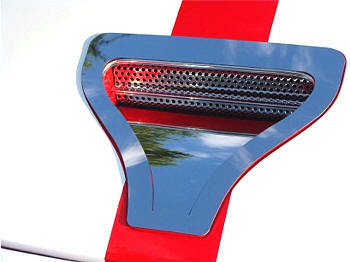 This high quality solid Stainless Steel grill will dress up the empty black hole at the opening of your hood air intake. 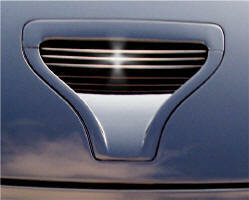 Hood Scoop Trim (Shown) sold separately see product below. High Polished Stainless Steel Hood Scoop frame plate. One piece part. Very Easy Installation. Simply Peel and stick for a permanent bond. You do not remove any parts from your hood to mount this part. Looks awesome! 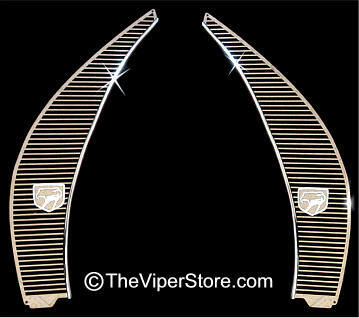 A must have for any Viper Owner who shows his or her car. Billet Hood Scoop Grille and Part# ACC-962002 and Perforated stainless steel Grille ACC-962013 sold separately. 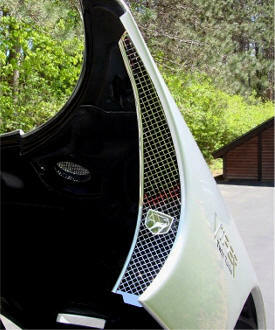 Shown here with perforated grille sold separately on this site. 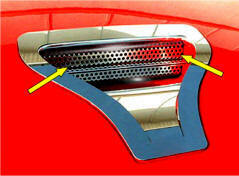 Scoop Grille part no: DVBV101 not included. Hood Scoop Grille sold separately.